Lightweight Strength and Best-In-Class Warranty now available with Integrated Air Disc Brake knuckles. 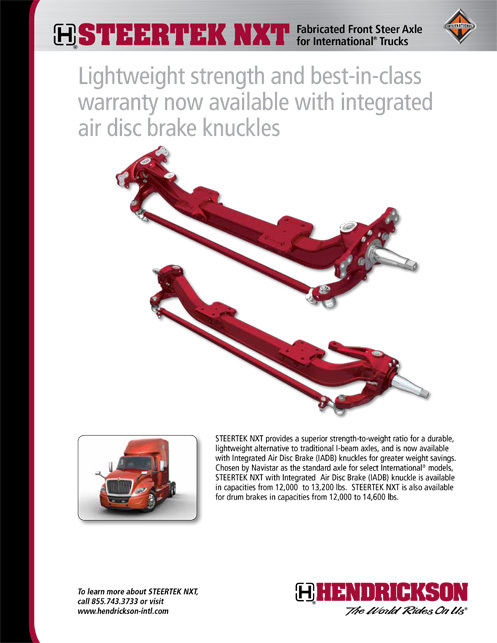 STEERTEK NXT provides a superior strength-to-weight ratio for a durable, lightweight alternative to traditional I-beam axles, and is now available with Integrated Air Disc Brake (IADB) knuckles for greater weight savings. Chosen by Navistar as the standard axle for select International® models, STEERTEK NXT with Integrated Air Disc Brake (IADB) knuckle is available in capacities from 12,000 to 13,200 lbs. STEERTEK NXT is also available for bolt-on disc and drum brakes in capacities from 12,000 to 14,600 lbs. Available in capacities from 12,000 to 13,200 lbs. All applications must comply with applicable Hendrickson specifications and must also be approved by Navistar with the vehicle in its original, as-built configuration. Contact Hendrickson and Navistar for approval of additional applications. *10-year, 1 million mile limited warranty covers certain structural components only. 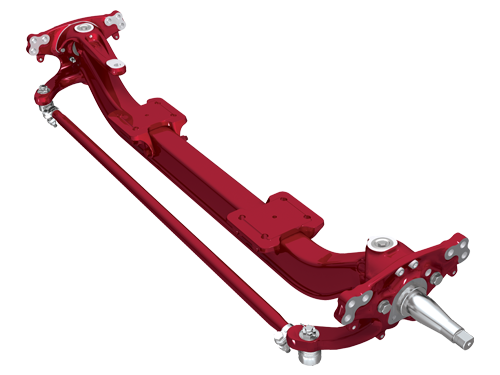 Warranty coverage applies to the axle beam, steering arm, knuckle assembly and kingpin when used in applications approved by Hendrickson and within the proper guidelines of the product. Warranty does not cover components experiencing normal wear. Contact Hendrickson for full warranty details and limitations.